Broken Wings? – Pardon the Mr. Mister reference, but are the Detroit Red Wings on the verge of yet another bitter disappointment? Mike Babcock’s club wakes up this morning with no series lead after four first-round games against Nashville. Heck, he hasn’t even made up his mind as to which goaltender will start Game 5 after the Predators chased Dominik Hasek in Wednesday night’s 3-2 victory at the Sommet Center. Hasek allowed three goals on 14 shots before being pulled midway through the second period. Chris Osgood, one of the most underrated performers at any position this season, came in and stopped all 13 shots he faced. So, Coach, who gets the start in Friday night’s Game 5? “I want to take a deep breath,” Babcock said. Friday’s game will be a difficult task for the Wings, regardless of who gets the start. Nashville is rolling, although it will have to find a way to win in Detroit, something it has never done in the postseason. Role Reversal – One year ago, it was the Ottawa Senators saying goodbye to the Pittsburgh Penguins. Wednesday night at Scotiabank Place, it was Sidney Crosby and the Pens sending the reeling Sens home for the summer, winning Wednesday’s Game 4, 3-1. Pittsburgh swept Ottawa in four straight after losing to the Sens in five first-round games last April. It’s also quite a change for the Senators, who went all the way to the Stanley Cup Final last spring before falling in five games to the Anaheim Ducks. This season, Ottawa cruised out to an early lead in the Eastern Conference before the wheels came off, which led to the firing of coach John Paddock. Bryan Murray, the GM and last year’s coach, couldn’t do much to fix it, as the Sens dealt with various injuries and on-ice struggles for basically the entire second half of the season. No Fluke – New York’s Marc Staal was probably sick to his stomach Monday night as he watched the New Jersey Devils celebrate John Madden’s overtime goal in Game 3 at Madison Square Garden. Wednesday, just 48 hours after Madden’s shot went off Staal’s skate and past Henrik Lundqvist, the Rangers’ rookie defenseman put the Devils on the brink of elimination when he broke a 3-3 tie at 16:47 of the third period with a seeing-eye slapper in an eventual 5-3 win at MSG. The Blueshirts have a three-games-to-one series lead and can send the Devils to the golf course with a win in Friday night’s Game 5 at the Prudential Center. New York won the first two games of this best-of-seven series at The Rock. 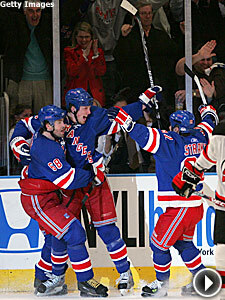 Staal’s teammates were ecstatic. After all, it wasn’t as if the rookie fired the puck into his own net Monday. Rangers center Scott Gomez agreed. 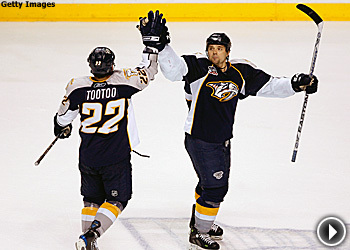 Staying Put – It was only a few months ago when Sergei Samsonov was toiling in the American Hockey League. Wednesday, he landed some security with an NHL club. After being claimed off waivers from the Chicago Blackhawks on Jan. 8, Samsonov was rewarded Wednesday for his play with the Carolina Hurricanes with a new three-year contract worth $7.6 million. The 29-year-old had 14 goals, 18 assists and a plus-9 rating in 39 games for Carolina.